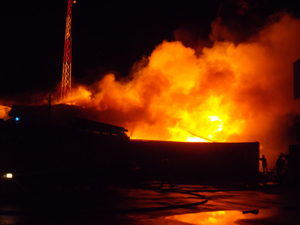 Fire fighters last evening risked their lives to fight an inferno which destroyed the stock bond of the Comfort Sleep Company and gutted another bond belonging to Payless Variety Store. The blaze erupted just after 19:00hrs. According to an eyewitness, around 19:00hrs, she was shaken by a loud explosion. “I was watching television when all of a sudden I hear this big boom so I get up fuh see if something happen but I didn’t see anything. It was like 10 minutes after that I hear more things started to explode. Then I hear me neighbour saying Comfort Sleep was on fire,” the resident said. The woman said that when she and other residents ran to the scene, the fire had already spread alarmingly, giving off an unbearable heat, which had scores of persons standing a good distance away. The fire destroyed the stock bond of Comfort Sleep and gutted another belonging to Payless Variety Store. Another resident said that while he was standing at the corner of the Street, he saw a big flame coming from between the two buildings. “I see this thing just explode and shoot up in the air but with all them things they had in there it just add to the fire which threatened to get out of control,” the eyewitness said. The security guard at the Comfort Sleep Factory said that the fire started at the Payless Bond. “I sit down here and all I see is this big ball of flame blow through the window at Payless and it took no time catch the bond,” the security guard said. The man added that he immediately contacted the Guyana Fire Service who acted promptly. “They tek like 10 minutes fuh reach here and two a dem come but then another set come after because they water run out,” the guard said. One of the employees of Comfort Sleep, Amanda Chung, said that about 20:00 hours she received a call notifying her that the bond had been destroyed by a fire. “I just hear the fire start from Payless and that the stocks bond where all the chemicals to make the foam all gone,” Chung lamented. The employee said that there was no one in the bond at the time of the fire. Although she was unable to estimate the total losses, Chung said that the building which stored the raw material and chemicals to make the foam was insured. Operations Manager, Deodat Narine, said that he was at home when he received a call from the security guard just after 7 o clock notifying him that he heard a loud explosion. Narine said that when he arrived on the scene the entire structure had already been burned to the ground. He added that although the fire is a big blow to the company with its local and international orders, the 35 employees will not be out of jobs. Deodat also explained that the chemicals stored in the bond could have posed a setback for the fire fighters as these elements will continue to burn. “The Chemicals we had in there, no matter how much water they throw, will not stop burning till all burn out,” the manager said. Residents in the area however commended the efforts of the fire service which managed to save the nearby factory from setting alight. “We got to give it to them men they really risk they lives the fire wasn’t easy to battle and they save the big factory because all of dem close up together,” one resident said. As fire fighters battled the blaze four explosions rent the air. Two barrels filled with flammable chemicals were also sent flying through the air and sending onlookers running for their lives. Luckily the barrels landed in the fenced perimeter.